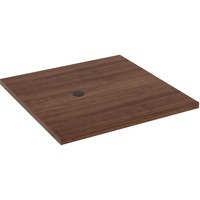 Lorell Prominence Conference Table Top LLR97612 $116.09 Adder section lets you expand your Lorell Prominence Infinite Length Conference Table by nearly 4'. Complete table includes a matching tabletop, modesty panels, straight end bases andor curved bases all sold separately. Mahogany melamine laminate offers a durable surface with a 3mm edgebanding to last for years of meetings. High pressure laminate is stain resistant, spill resistant and scratch resistant. 2 thick adder tabletop is made with melamine faced chipboard and medium density fiberboard with a 50mm thick honeycomb frame. Use the 3 14 grommet for easy cord management. Weight capacity is 80 lb. 36.5 kg. Adder section includes mounting hardware.